Organising wedding guests around individual tables at a reception can involve some amazingly intricate logistical feats! Creating and displaying a wedding table plan for your guests takes one more worry from your shoulders for your reception. Your table plan can even showcase your creativity; everything from the simple elegance of calligraphy to clever vintage designs that match the theme of your wedding helps your guests find their places at the table. Medieval nobility had it easy when it came to designing seating plans for large events. Arranging guests seated at long tables presents little challenge! When designing your seating arrangements, keep family members & couples together where possible. Your guests are there because they love you, but also enjoy being near their loved ones. It’s wise to keep parents close to children; boisterous kids might enjoy being unsupervised, but those near them may not. Consider any special needs your guests may have. If your great-grandmother has a bit of trouble hearing, seat her near the wedding party’s table so that she can hear the toasts and be a part of conversations. 2. 50/50 Male and Female? While it’s traditional to plan for an equal number of men and women at each table, let your knowledge of your guests be your guide. University mates, co-workers and other groups that feel comfortable together should not have to split up to meet an arbitrary quota of males and females. However, if you seat larger groups of people who know one another well together, ensure that the remaining seats at the table go to people who also share a common bond. Seating individual guests with big crowds can leave them feeling rather isolated. 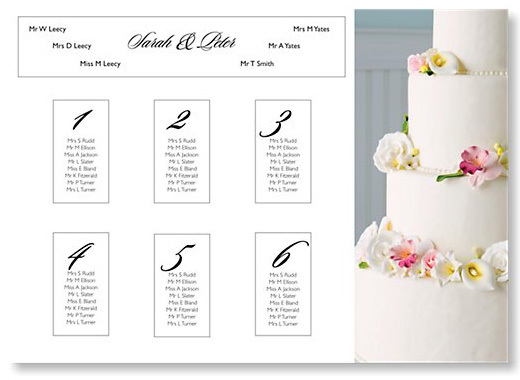 At its most basic, a wedding seating plan consists of a single display card with guests’ names written alongside numbered tables. 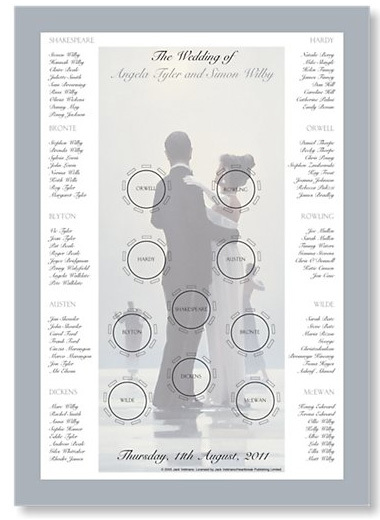 Matching table plans to your wedding colours ties them thematically to your ceremony. For a traditional wedding with a formal aesthetic, printed names in beautiful calligraphy always look appropriate. However, you aren’t constrained to this style; for a vintage wedding theme, choose fun fonts appropriate to the era. Hand-writing your wedding table plan adds a sweet personal touch. Perhaps you could write in coloured chalk on a decorated chalkboard or affix each guest’s name to an antique key. Or for a spring/summer wedding, create small bouquets of fragrant flowers in small pots and write names on wooden markers. Whether you choose tradition, whimsy or a blend of both for your seating plan, your guests will appreciate your thoughtfulness in preparing a place at the table for them. 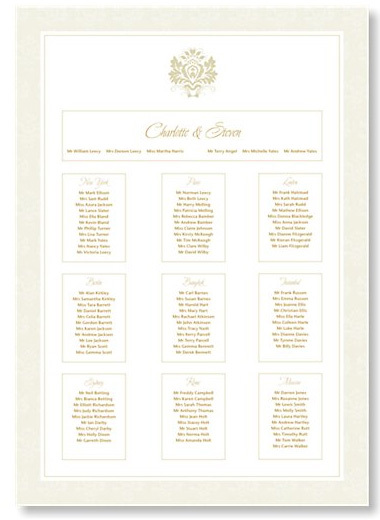 Luxurious yet affordable, discover the B&G wedding table plan range.